You will never be able to enjoy the fun—and easy—question “What’s the answer to the ultimate question of life, the universe, and everything?” again. Not once you’ve seen Senator Ted Cruz start off the confirmation hearing of Trump’s Supreme Court nominee, Neil Gorsuch, with it. 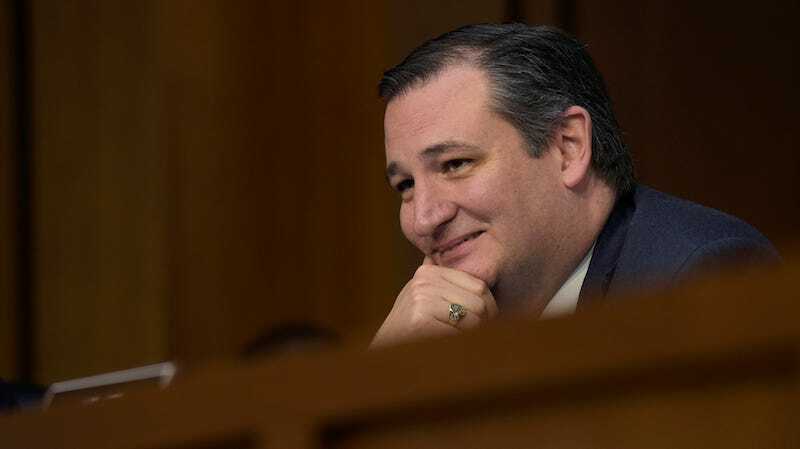 It’s partly so that Cruz can trot out a pop culture reference in a way that has become de rigueur for politicians trying to show how “with it” they are. Some pull it off. Others... do not. Here’s the difference: Congressman David Cicilline made a Stranger Things reference as part of a speech, using pop culture to illustrate a point. It was absolutely cheesy, but it served a purpose as a metaphor, and was made in his own words. Meanwhile, Cruz brought up Hitchhikers as a softball non-question for a Supreme Court nominee. It’s not just sucking up, it’s a signal that nothing substantive is going to come from either party in this hearing, that “Hey, we’re all such good friends we’re just going to make jokes together.” The obviously pre-determined reference also allowed Gorsuch tell a “funny” story about how he likes to ask that question when he swears new lawyers into the bar. Cruz is using a pop culture reference to make Gorsuch likable as a person, instead of investigating his character and abilities as a judge. I would also like everyone to enjoy the irony of these two men quoting Douglas Adams, who was a) an atheist b) an environmental activist. I’m sure that his words being read out and explained by Ted Cruz is exactly what he would have wanted.